Welcome to the Poplar Bluff High School Sho-Me Band page. Sho-Me has been a part of so many lives throughout the years. There have been so many different contests in different places, concert bands for friends and family, pep band to support the various sports and who says you can't bring it with some drum! As many of you know, many schools are faced with the problem of music programs either being decreased or folding altogether. Even if the music program is saved, the students are left using very outdated instruments and uniforms. 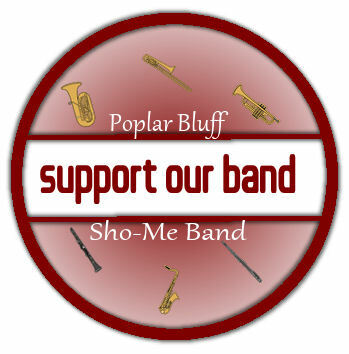 Poplar Bluff Sho-Me Band is asking you to help support the future of our band by helping raise the necessary funds to keep this program up and running. If anyone has any other ideas on how to raise additional funds, please contact a local band booster. They are also seeking corporate/business sponsorships from area businesses to help with funds and to raise community support. If anyone knows of a business or corporation willing to help, please contact a band booster. Sho-Me Band members and boosters will kick off the annual Sho-Me Band Discount card sales Tuesday July 2nd. The cards are still $10.00 each. There are 23 local business discount offers on the cards this year. Contact a band member or band booster to purchase your 2013-2014 Sho-Me Band Card or you can contact me via Facebook. The 2nd annual Sho-Me Band Gun Raffle ticket sales start October 1st. The tickets are $5 each and the drawing will be held at 303 Sporting Goods on November 1st at 4pm. The gun is a Savage Arms Hunter XP .243 caliber bolt action riffle with a Bushnell Scope. Purchase your tickets from a band member or band booster. We will be selling tickets at Wal-Mart on October 5th from 12-4. Don't forget to check out the Sho-Me Band Alumni Forum section. Come on in and do a little posting. Don't forget to check out the Sho-Me Band Facebook Page.